Be prepared folks, this is Powerman and this event will test the system. Especially if it becomes a hot day. Whether you are a seasoned duathlete, a veteran of the sport looking to qualify for the World Championships or an endurance athlete looking for a great challenge. This event will not disappoint on any level from our first class presentation and event management to the great courses and post race snack tent finishing a stellar day with the raffle and awards ceremony. Course cut off: 5:30 hrs. Raffle / awards will start at 1:00. No Friends or Family members allowed in the transition area for any reason. ITU European style transition formats will be used wherever possible. If you are unfamiliar with this style of racking it is one long row. The race director and race officials will close the transition area 30-45 minutes before race start to ensure all athletes are at starting lines for mandatory course meetings and announcements. Once the transition area is closed, you will not be permitted back in before the race starts. Family members will not be permitted in for any reason. In the event of inclement weather, we recommend you have warm, dry clothing outside the transition area to put on following your finish due to other athletes still being on the bike course. Thank you for your cooperation in following these rules. You must rack according to your race number, based on the sequence numbers placed at the end of each row. Please remember racks will hold 7 bikes racked with the seat tip on support bar. Please be courteous to fellow athletes to ensure there is space for 7 bikes on a rack. The transition area is closed until all athletes are off the bike course. Any athletes removing gear from transition areas before the announcer or race director has officially opened the transition area will be DISQUALIFIED from the race! No questions asked. Your race number will be taken down and you will be disqualified. Sprint athletes this goes for you as well, you must wait until all the athletes are off the course and race officials open the transition area. All athletes deserve a clear transition. There will be an aid station at the run in/out chute with water and electrolyte replacement. Athletes wearing their own chips, PLEASE remove your chips before re-entering the transition area and exiting again. This will cause a timing error. Run in/out and bike in/out chutes are clearly marked on the large structures at either end; it is your responsibility to go the right direction. Starting out cross-country style right outside the transition area each wave will line up and head straight into the sport loop trail. This trail will slowly and gradually go from 40 feet at the start, 20, 10, to about 6 feet with a few sections down to 3 feet. To say this is a fun course is an understatement, it is just as fun with running shoes on as it is on the bike. You will roll up and down, high banked turns to keep your speed up with a few short climbs it really is a fun trail run. 5k per loop. Bringing you right out at the finish line or out for lap 2 and into the transition area. The course will be clearly marked with flags and cones. It truly does not get any easier than this, straight up to the back of the park, around and back. 1 loop super sprint, 2 loop short, 3 loops classic. As easy as it will be to navigate you will earn the finish medal and you will feel that bike course on the second run. At first glance you will say \"not a big deal\" but the slow gradual 460\' of elevation gain will be felt in the quads for sure, especially for the Classic distance athletes. The downhills will be welcomed and will feel like a rocket ship taking off under your saddle. The pavement is like much of the pavement in Arizona, sun beat with some rough rolling out there but those on carbon bikes will be glad they have them. Athletes exit the parking lot to a Left turn heading up towards the parking information and camping area. From that point a fast sweeping rolling downhill to the back of the park and back. 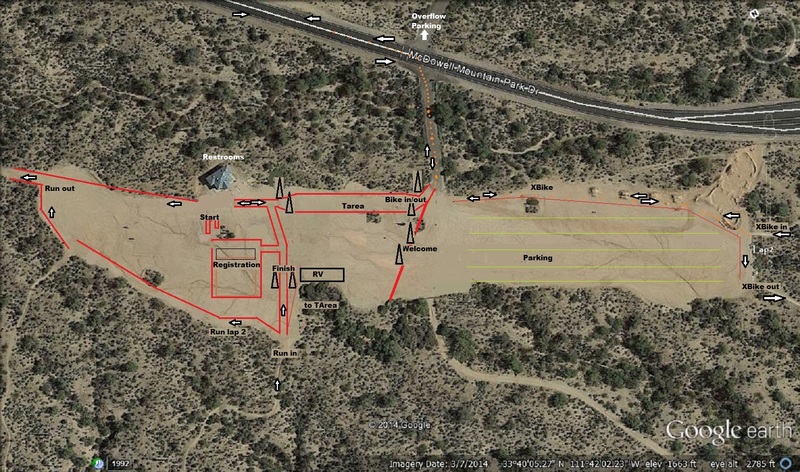 The aid station will be located right in front of the transition area, as you make the turnaround at that point and head back up to the park. 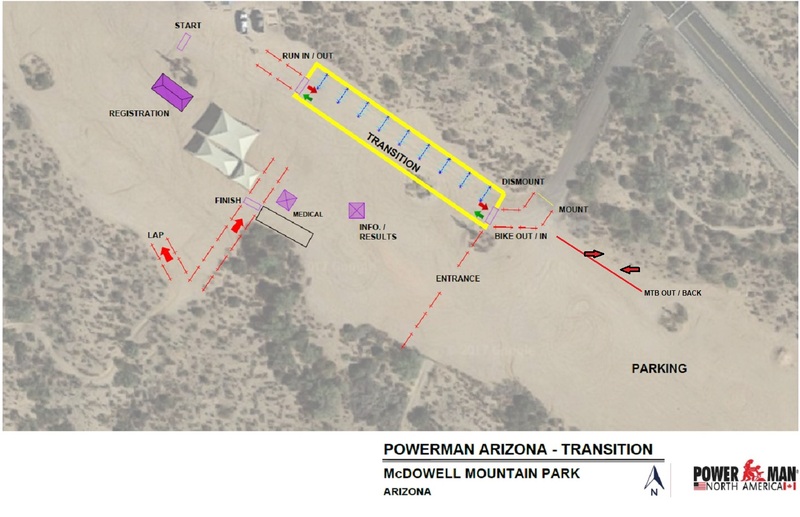 Aid Station Powerman distance athletes only, You will hit this 3 times on the bike. Water, Lemon-lime Gatorade Endurance Formula will be available. The mountain bike course features the parks widely used competitive long loop. This has been used for countless mountain bike races over the years. A great course with a pretty balances mixture of everything from single track to fast descents and short challenging climbs. Fast flat sections with short rolling rises will keep you excited and focused. 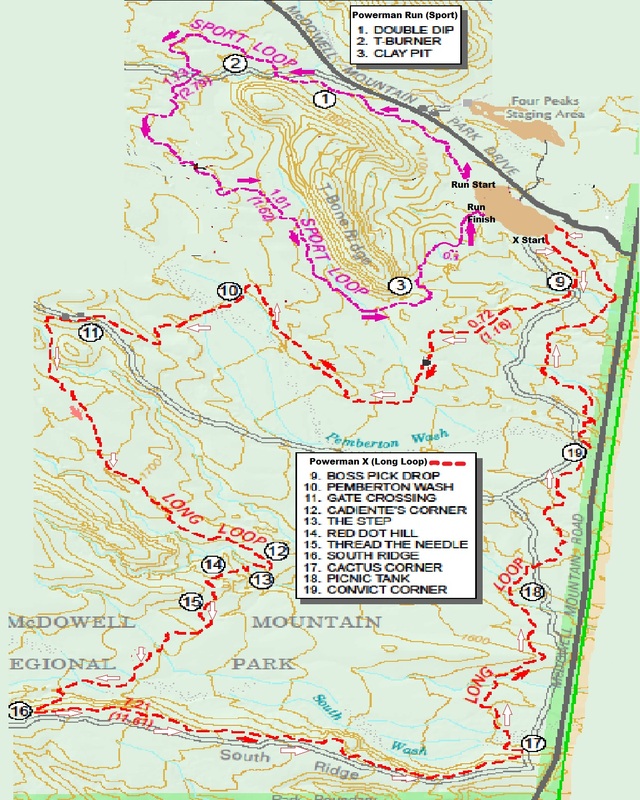 This is a 7.7 mile loop, Short 2 loops. The first tip is incorporate some hill training into your weekly regimen if you have not already done so. 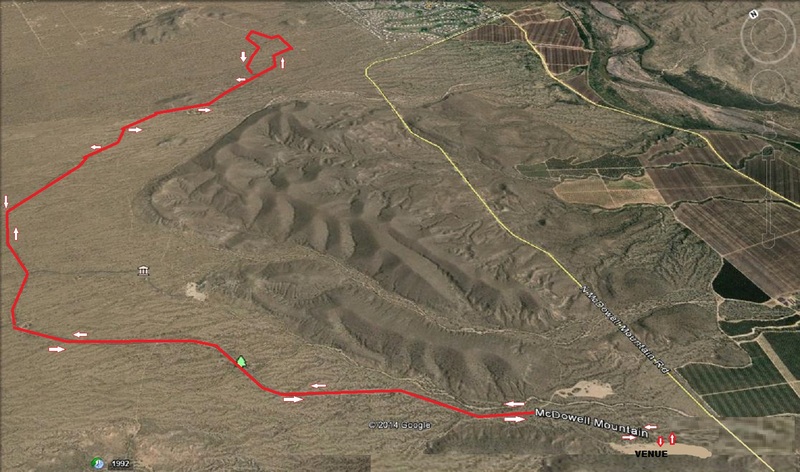 Specific to the race this is interesting and a course I thoroughly enjoyed for years as one of my go to brick workouts back in the 90\'s which spawned the McDowell Mountain duathlon and off road running series back in the day. We also used it for our cross-country home course at Fountain Hills high school when all the building took our course in town. So I have a ton of experience on all these courses and could not count how many times I have ridden in the park over the years residing in Fountain Hills. So besides the obvious I offer this tip being out in the desert at 6:30 a.m. it is going to be cool, maybe even downright cold. As the sun clears the mountains you will feel the warmth immediately. So I am telling you to be prepared for a potential 40 degree temperature swing over the course of the morning into the early afternoon. Folks, that is significant and can mean the difference between a good race and a fast race to a race holding on to the finish. 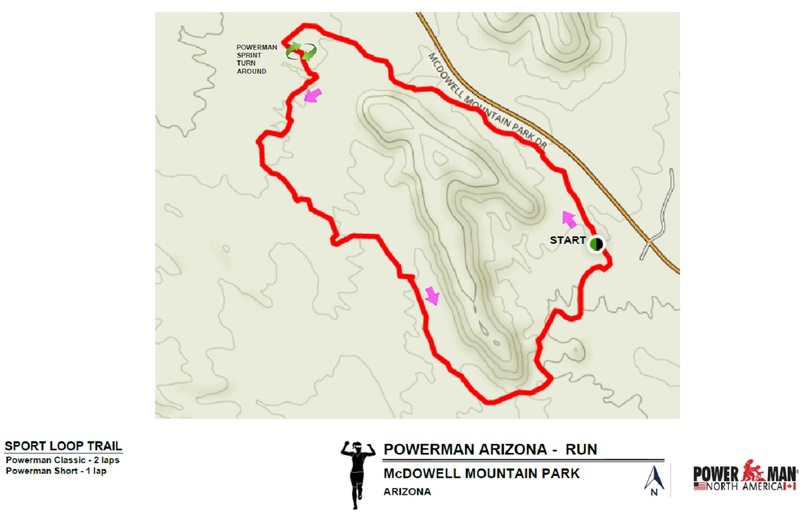 Being prepared for that type of swing and potential wind is really what can make or break your race in McDowell Mountain Park. See ya soon. So the other obvious is trail running shoes versus your racing flats.